So, being that my college degree is an art degree I thought I would blog about a question I received tonight while teaching at the Austin Coding Academy. RGB is what monitors use for colors because monitors give off or “emit” light. The distinction here is that RGB is an additive color palette. The more color you add to it, the brighter it gets. Add all colors together, you get white. The brightest of color. Makes sense right? Because a monitor gives off light. 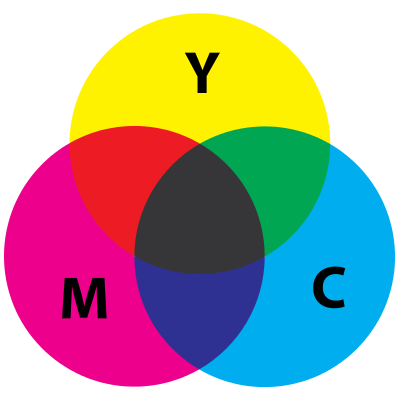 CMYK is what you would see on a printed page because pigment or color “absorbs” light. CMYK is a subtractive color palette. The more colors you add, the darker it gets because pigment on printed material absorbs light. Mixing paint results in darker colors, whereas mixing light results in lighter colors. 🙂 In painting, primary colors are Red Yellow Blue (or “Cyan”,”Magenta” & “Yellow”). But for light, the primary colors are Red Green Blue.